He is not like us. Warner Bros has finally debuted a trailer for Jeff Nichols' long-awaited new PG-13 sci-fi movie Midnight Special, that he made for the studio before moving on to make Loving. Nichols' regular Michael Shannon stars along with Kirsten Dunst as the father and mother of a very special, very unique boy named Alton, played by Jaeden Lieberher. In addition, Joel Edgerton and Adam Driver show up as well. This looks a bit different than I was expecting, but I'm looking forward to it nonetheless because I still have hope for this Jeff Nichols sci-fi. I'm curious to see how everyone responds to this footage. Enjoy! A father (Michael Shannon) and son go on the run after learning his child possesses special powers. Jeff Nichols' Midnight Special has always been billed as more of a family film, and it has a PG-13 rating. In an interview Nichols explained the origin of the idea behind this: "I want to make a 1960's biker film. I want to make a big, PG summer blockbuster family film, kind of like I want to revamp Tremors. I've got an idea for that. That kind of movie." This is Jeff Nichols' fourth feature film, following Shotgun Stories, Take Shelter and Mud previously. Warner Bros originally had this set for release this Thanksgiving, but pushed it back until next year. 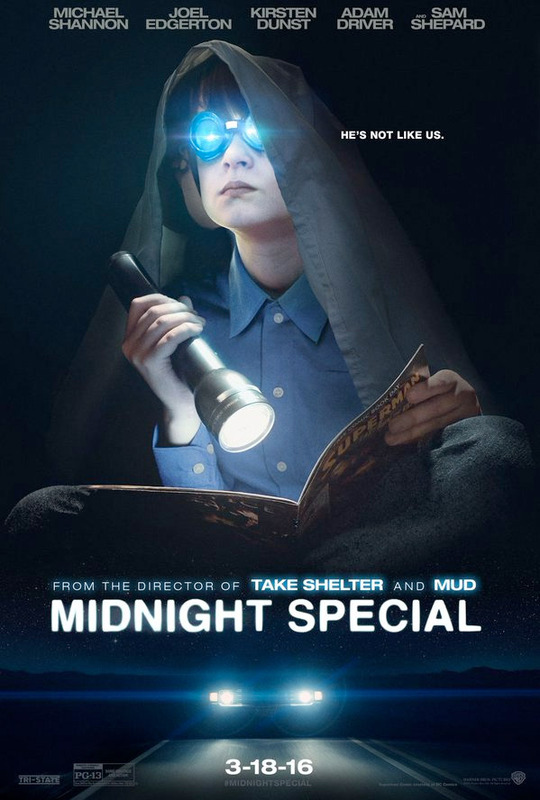 Midnight Special now opens in theaters starting March 18th, 2016 next year. Thoughts? A must watch for me.... liked mud! I'm getting an Unbreakable vibe from this film. Looks really fantastic. Take Shelter is one of the best films I've ever experienced, Mud was great too, still have yet to see Shotgun Stories, but I'd give that and this film a shot anytime since he's on a wicked hot streak thus far. I'm just worried that, if this film turns out to be a masterpiece, it'll be completely decimated at the box-office by Batman v. Superman. Shotgun Stories was a lot more straightforward but it was still really good. You can definitely see a progression in his abilities though, so I'm pretty psyched for this movie. Take Shelter was amazing, Jeff Nichols, David Wingo and Michael Shannon is a great combo. Looking forward to this one. ET with a human. Watch when a director and his actors elevate an otherwise tired plot. I sense greatness. Yeah, looks pretty damn good. wtf, yes please. Awesome cast.